Whether your licensing interest is focused on art, brands or characters, it is the effort you put into selling that creates your licensing deals. Your greatest sales are achieved when you have a thorough understanding your product (what it is you are trying to license), so that you are able to connect directly to the right audience (most often a manufacturer, retailer or media). If you are new to licensing, what you first want to do is organize your list of potential product categories and then prioritize them. 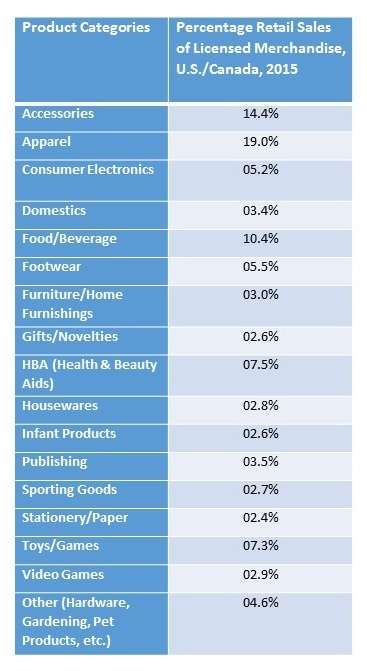 For your reference, here is a list of product categories and their percentage of licensed merchandise retail sales in the U.S./Canada in 2015, as reported by The Licensing Letter. Once you have developed a good strategy for your property, in terms of product categories, it will be much easier to direct the growth of your lead list. When looking for prospective manufacturers, there are many opportunities to find them and do research before including them on your list. The more targeted you are in creating your leads, the more manufacturers will respond positively to the opportunities you present. I hear from manufacturers, over and over again, their number one complaint is that they receive too many presentations that are not relevant to their specific business needs. Do yourself, and the manufacturers you are seeking, a favor by doing your research and targeting your offerings to their business. They will appreciate and recognize your focus, and you will progress faster. Remember that lead lists are organic in nature; they increase and decrease, again and again, over time. A list of 30 companies may grow to 100, then reduce to 40 leads, as you determine that some of the companies are not, in fact, a match. Here are eight ways to help you develop your own licensing lead list. Some of them require an investment and others are free, except for your time and effort. 1. Trade Shows — Trade events and their directories exist in every product categories. If you attend a trade show, make sure you bring home the directory or you can ask friends to bring you a copy of the directory from the shows they attend. Sometimes you can even find exhibitor lists, before and after their annual events, on the association and exposition web sites. Just to see what is out there, I searched the Internet for some of the most popular trade shows in product categories that are important to licensed artists. Within five minutes I found a PDF titled, ‘Exhibitors for the 2016 International Home + Housewares Show.’ This 35-page document included company names, contact information, address, and phone and fax numbers. Needless to say, if you are willing to spend the time, there are always inexpensive ways to get the information you need. 2. Trade Magazines — As you read trade magazines associated with the product categories that you have chosen to target, check out the companies that seem to be a good fit for you and your art, designs, illustrations, brand or characters. Always make notes about their product lines, employees, contact information and licensing deals, so you have the details handy when you are ready to contact them. 3. Shopping — Spend time shopping in retail stores and outlets for the products you want to license. This will be time well spent as you explore manufacturers that are already doing licensing. You will probably also see ‘private label’ products with art and characters; these are the products that don’t readily identify the manufacturer on the product itself. These D-T-R, or Direct-to-Retail, products are often branded under the retail establishment’s label (i.e. Target’s or Walmart’s instore brands) and it may be difficult to find out who manufactured them. There are more and more of these D-T-R’s deals being done every day as stores work harder to have unique product in stores. To identify these manufacturers, it may require a licensing industry agent, retail expert or a professionally compiled lead list. 4. Use the Internet — The Internet continues to be the primary source for researching manufacturers. Although, these days, larger companies are less likely to list their phone numbers and email addresses on their websites, you can still often find the information you want with a little extra effort. And when you get frustrated, just think about how we used to do it before the Internet. I also recommend connecting on LinkedIn with the executives you are trying to reach. Most professionals will consider ‘linking’ to you, since you are in the business, and then you can start a conversation. 5. Networking — Again, thank goodness for the Internet and social media! Now you can talk to other licensed artists and creators through the many specialized social groups on Facebook, Twitter, LinkedIn, and Pinterest, as well as at industry events and trade shows. Networking can become a primary source of ideas and leads. If you are open about sharing your connections, then others will do the same. 6. Ask for Recommendations — If a manufacturer doesn’t think you are a good fit for them, ask them what manufacturers they would recommend you talk to (and get the contact information). This is a really overlooked technique that allows you to tap into the brainpower of the manufacturers who know the business best. If you were thoughtful in your presentation, and had relevant reasons why you felt they would be interested, then you didn’t waste their time and the manufacturer may be very open to sharing their thoughts about other licensing partner options. If you are short on time and have the money to invest, you may want to consider one of the following licensing industry directories. 7. EPM Communications — The Licensing Letter Sourcebook is annually updated to include licensing decision-makers from manufacturing companies, as well as properties, agents, attorneys and consultants. So while it is not an inexpensive resource, and you may use only a fraction of the information, I have found it to be the most reliable in the licensing industry. In the long run, it will save you valuable time and money in getting names, phone numbers and email addresses. EPM has just announced that their updated 2016 Sourcebook is available. It includes the contact information for more 7,400 licensing professionals worldwide, 2,000 licensors, 3,600 manufacturers, 1,000 licensing agents and 730 attorneys and industry consultants. If you want more information you can contact Randy Cochran at randy@plainlanguagemedia.com and here is a link for more details. 8. Total Guide to the Licensing World — There is a new, less expensive, online database which will be available in October. According to Joanna Cassidy from Total Licensing, their database will include over 2,600 licensees/manufacturers. This is a worldwide licensing industry database with contacts in more than 90 countries, but approximately 30% of the contacts are in the United States. The annual subscription cost will be just under $200 for full access to the Total Guide Guide to the Licensing World. The directory includes 125 word listings, plus all contact information and social media links. If you are interesting in being included in the dirtectory you can email joanna@totallicensing.com or click here for more details. There are quite a few options for building your lead lists. It really boils down to whether or not you want to spend your time, money or both. I can’t emphasize enough that even having a terrific lead list isn’t enough to get you deals; you have to finely target your list, learn from the manufacturer responses, continually update your list and last, but not least, spend time actually sending the presentations out and following up! For the licensing industry, the spring and summer trade show season is where many artists and creators hope to find their big breaks. It is an exciting time of year for property owners and businesses looking to make connections within the industry. Right now, many will attend and exhibit at the Licensing Expo in Las Vegas, the largest licensing trade show in the world. Here, the entire industry revolves around sales and strategic partnerships, which will be developed between the creators and brand managers with manufacturers, retailers, advertisers, the media and other producers and distributors from around the world. Billions of dollars are spent and made. Everyone is trying to attract the attention of attendees and exhibitors, and vice versa. With such a tremendous visual barrage constantly battling for attention on the trade show floor and surrounding the entire event, it is can be very easy to get lost in the details and lose sight of the original purpose for being there—getting great leads. Keep in mind that the time, money and effort that has been put into either attending or exhibiting at the show will be completely wasted unless you are properly organized and follow through with the leads generated. Be aware – internet research suggests that between 50 and 80 percent of all sales leads are never followed up on. This is the most common and expensive mistake a businessperson can make. I recommend following just a few simple and effective planning methods to prepare for the next industry trade show, which will keep communication flowing, maximize follow-through and follow-up and prevent this costly error. 1. Treat everyone with interest and respect. A lead is someone who is ready and willing to engage in a conversation. Either they are someone that you could do business with directly, or they might be able to introduce you to someone who can. Some contacts will become leads, some leads will become prospects, and some prospects will then become clients. You never know who you are talking to or what’s going to happen, so make sure you treat every lead as if they were your client. 2. Keep your ego out of the way! This is as true in business as it is in everyday life, and there has never been a better time to follow the theory of “less is more.” Letting someone else talk and share their news and information is always the best way to gather data and allow relationships to grow. Being prepared to listen and ask lots of questions is the best way to get them talking and interested in you. 3. Everyone is different. Always try to look at your prospect from their perspective. What is it he or she needs? As you are listening, try to read between the lines. Pay attention to his or her, tone, level of interest and body language. And try not to get overconfident or self-conscious. Remember: You have hundreds of potential leads to talk with. If they are interested, great; if they are not, politely move on. 4. Collect the who, what, when, where, and why. Whether at the show or after you return to your business, you need to gather as much specific information as you can to keep the conversation moving forward from lead to prospect to deal. The five Ws, as they are referred to in journalism, are a time-tested, focused and valuable method for collecting the facts. I strongly suggest you use this technique. It is easy to remember and it provides you with a practical and profitable way to organize your thoughts and business, as you progress with each encounter, meeting and follow through during and after the show. 5. Organize and prioritize your leads. 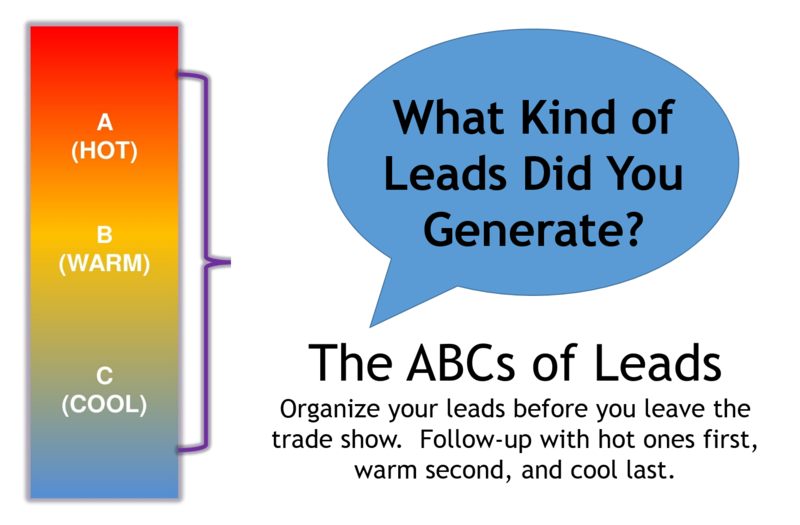 Don’t wait until you get home to designate and separate your hot, warm and cold leads; it is too easy to forget the details. Writing on business cards works, but attaching them to larger cards or in a notebook gives you more room for writing. Taking thorough notes during the conversation and after each encounter assures that you won’t miss a beat when it comes to that all-important follow-through. 6. Always follow-up within 48-hours. While many trade show attendees and exhibitors do not follow-up at all, the remainder often follow-up in a less than timely fashion. In general, research shows that responding within 48 hours of a prospect contacting you, dramatically increases your closing rate. If you have so many leads that you cannot contact them all within two days, then you should at least reach out to as many as possible within the week. Remember: This is the culmination of all your efforts. You must do this or nothing will happen. 7. Personalize your follow-up communication. Always personalize your communication, as much as possible, but it’s most important with your ‘hot’ leads. This is where your customized presentation pays off the most. Make sure you send your prospects exactly what they requested and what you promised. Turning a “no” into a referral. There is no doubt that you are going to receive your fair share of no’s at any trade event. Accept it. Don’t worry about it. Here’s how to use it to your advantage. Ask those who do like your art, brand, character or property, who else they would recommend you speak with. This means that even if you can’t do business with someone who admires your business, they might very well refer you to someone who can, if you ask. 8. Think of ways to keep in touch. Whether through emails, phone calls, a newsletter, or other systems, develop a plan to continue to communicate with your prospects on a regular basis, hopefully moving them from leads to clients. Deals rarely close after one meeting, phone call or trade show encounter. It takes continuous effort and persistence to shift each communication to the next level. Property owners, businesses and artists must remember to keep following up until a deal is secured. Once that’s done, you must make sure to continue asking questions of your clients, and listening to the answers, to promote a long and healthy business relationship. Many people don’t want to “bother” their leads too much, but it’s important to remember that is why everyone is here. Continue to follow-up and be pleasantly persistent. Note: This article was written for and originally published by ‘The Licensing Book,” Summer 2015. With constant inquiries about how to organize your sales and trade show efforts, I know this article will be appreciated again. When evaluating your year-end business results and projecting for the New Year, don’t forget to look at current and emerging trends. In my blog yesterday, Easy Two-Step Business Plan for 2012, I asked the question: “What trends do you expect for 2012 that will affect your business negatively and positively?” Exploring the latest trends will change the way you think about your art and business. And new thinking is almost always good! One of the best ways to learn about trends is to connect with trendwatching.com and their latest trend briefing 12 Crucial Consumer Trends for 2012. It’s an eye-opener. Just reading down the list I can already imagine many new ways that art will express these trends for consumers and show up on products. One of the challenges of being ahead-of-the-curve and on-trend is the process of interpreting the trends themselves and seeing how they relate to consumers and then translating that into art for licensing. Again, I will refer to the experts at trendwatching.com who understand this problem and have come up with 15 Trend Tips which are all about moving beyond looking at trends to actually interacting with them. I recommend reading this section, even more than the trends themselves, so you can learn how to translate, discern, engage, experience, show, express and apply trends in your everyday life and in your art licensing business! Make it your 2012 must read, and sign-up to receive their free trend briefings. Marketing isn’t a part-time effort. If you have read any entrepreneurial books lately, this should come as no surprise. It’s probably the number one thing that stops people from opening up their own business. You have to market yourself—all the time. Oh, did I hear you say that’s what you want an agent for? I hear this comment very often. The problem is that if you don’t think you are not cut out for marketing, think again about being an entrepreneur of any kind. I mean, how will you get an agent if you don’t market yourself to them? How will you stay on top of your agent, once you have one, if you don’t understand how your agent does their job? How will you know the agent is doing the best job possible, if you don’t understand the industry and how marketing your art to manufacturers actually works? How will you sell the agent on your latest collection? Agent or not, you need to educate yourself on the ways to market yourself to your primary and secondary target audiences; that’s marketing talk for manufacturers (#1 audience) and consumers (#2 audience). Definitely put a plan together on how you’re going to market yourself. You need to allocate time regularly to marketing your fabulous art and product designs. 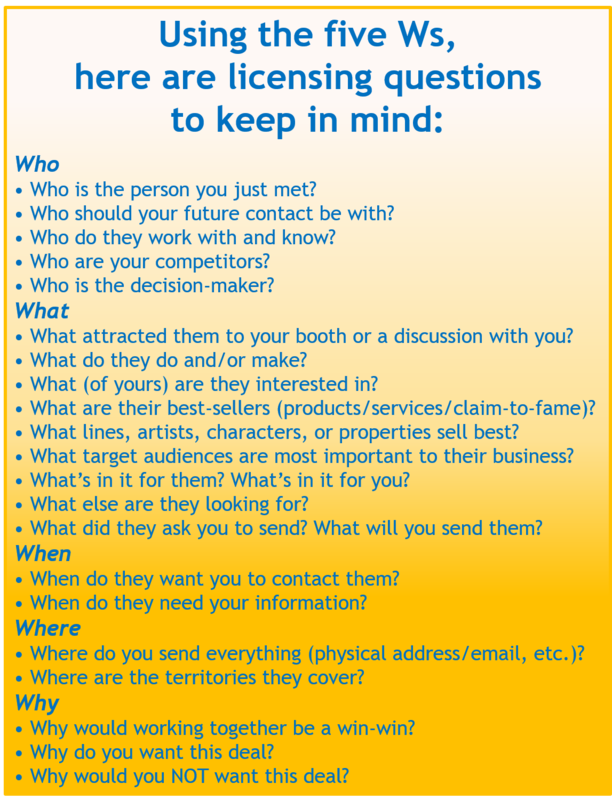 Think about tradeshows; your website; manufacturers; retailers; art submissions; presentations; sales calls; social networking; publicity. These are all things you need to be thinking about, and integrating into your marketing plan. As a guide, sales need to represent at least 60% of your time. This may be one of those deciding factors, which will help you choose whether you want an agent, or you want to do-it-yourself. If you’ve got marketing skill sets, and you can definitely divide your time between creating and marketing, then it’s much more lucrative to do it yourself. The number of artists who are choosing self-representation is really increasing. But it’s certainly not for everyone. Whether you have an agent or not…you STILL need to market yourself! Art talent isn’t enough to make it in the Art Licensing industry. Even more interesting is the fact that you may do very well in Art Licensing for any number of other reasons. For example, your art skills may be good; they may even be awesome! But you could be incredibly successful in Art Licensing because you can market yourself better than other artists. Perhaps you have the innate ability to capture the attention of various media outlets, or you have a large following of active and demanding fans (which would be is very appealing to manufacturers). I’ve seen artists make lots of money because they appeal to a certain niche audience (not a small niche, but one that’s large enough to warrant mass market attention) that is peaking and has a current need for art. Maybe an artist loves creating holiday themed art, for which there is always a need. Art Licensing is a commercial industry, so artists who have a distinctive style, enjoy creating a certain theme, and who also appeal to huge audiences have more potential for income than others. You definitely need computer and technical skills, or access to them. If you don’t have them, you need to get them or find a partner that does, because people will no longer put up with artists not having internet access, high resolution scans, layered files, etc. If you can envision your art on products, then show your art to manufacturers on product mock-ups to help them. This is a really important skill set today and is going to help put you in the league of serious art licensors. Not everybody is going to be a trendsetter, because that takes a lot of forward thinking.You may have that, or you may just love to watch trends, and can keep up with them. Either way, don’t avoid learning about trends and seeing how your art can interpret them.